OK folks, for today’s history lesson with Andy. threatened by the man approaching the shore—did he act to protect himself? in prison. But in 1891 under Canadian law the Crown claimed Slumach’s life. supposed connection to the legendary gold of Pitt Lake. the basis for all later tales. secret of the location of the mine with him, placing a curse on anyone trying to find it. Slumach and Pitt Lake gold—but there is nothing about that in the local press of that time. Eldorado, out there in the wilderness of Pitt Lake. Craigslist. Why do I even look at it. Humanity reaches a new low. 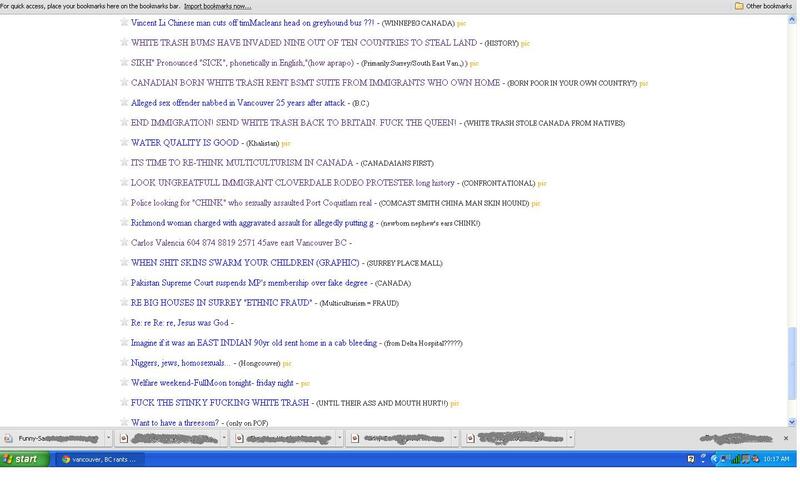 I have no Idea what your local section of craigslist / rants and raves looks like but this is what Vancouver , Canada’s looks like. I was making a little tour of it last eve and this clearly must be where the shallow end of the gene pool gathers to “discuss” the local topic of the day. Why this forum is not moderated one is only left to wonder. Does this type of public display of hate and racism even need a venue today? I will leave that up to others to decide that I guess. Without regret I shall never return to this thread. The history of education is a central theme in Canada’s social, economic and political history. In the 17th century education was usually an informal process in which skills and values were passed from one generation to the next by parents, relatives and older siblings. Four hundred years later, informal learning has become secondary to extensive systems of formal schooling under the jurisdiction of provincial governments. The Canadian insistence on the collective concerns of peace, order and good government has meant that state projects such as schooling are seen in terms of their overall impact on society. In order to understand the growth of schooling in Canada, special attention must be paid both to official policies and the changing nature of children’s lives. During the French regime in Canada, the process of learning was integrated into everyday life. While the French government supported the responsibility of the Catholic Church for teaching religion, mathematics, history, natural science, and French, the FAMILY was the basic unit of social organization and the main context within which almost all learning took place. In the labour-intensive economy of the 17th and 18th centuries, families relied on the economic contributions of their children, who were actively engaged in productive activity. Children learned skills such as gardening, spinning and land clearing from other family members. Young males were trained for various trades through an APPRENTICESHIP system. Similarly, because the population was small and dispersed, it was usually the family that provided religious instruction and, in some cases, instruction in reading and writing. In certain areas, parish priests establishedpetites écoles in which they taught catechism and other subjects. However, the majority of the population in New France, particularly in the rural areas, could not read and write. In the early 17th century, about one-quarter of the settlers were literate, but by the turn of the 18th century, the preoccupation of survival had taken its toll on the literacy rate and only one person in seven could sign his or her name. In the towns of New France, formal education was more important for a variety of purposes. The JESUITS,RÉCOLLETS, URSULINES, the CONGREGATION OF NOTRE DAME, and other religious orders provided elementary instruction in catechism, reading, writing, and arithmetic. More advanced instruction was available for young men who might become priests or enter the professions. By the mid-17th century, a course in classical studies, grammar and theology was available at the COLLÈGE DES JÉSUITES, founded in 1635. In the 1660s Bishop LAVAL founded the SÉMINAIRE DE QUÉBEC, which later became UNIVERSITÉ LAVAL. Formal instruction for females was quite limited and usually did not extend beyond religious instruction and skills such as needlework. However, girls who lived in the countryside may have been better educated than boys as a result of the efforts of the sisters of the Congregation of Notre Dame, who established schools in rural areas as well as in towns, and travelled as itinerant teachers. While only a minority of colonists in New France received instruction in an institutional setting, CatholicMISSIONARIES played an important role in formal education. The Récollets hoped to undermine the traditional culture and belief systems of the aboriginal people by educating the young boys and girls in the Catholic religion and in French customs. The Jesuits, who also embarked on an ambitious program to assimilate aboriginal people into French culture, compiled translations of the aboriginal tongues and established various schools. Other groups, such as the Ursulines, focused their educational efforts on aboriginal girls. However, the Catholic Church’s missionary efforts met with minimal success and the educational programs had little impact on the society of aboriginal people, in which learning continued to be viewed as an ongoing part of everyday activity (see ABORIGINAL PEOPLE, EDUCATION). School At Canoe Cove, P.E.I. Painting by Robert Harris, oil on canvas. This scene illustrates a Prince Edward Island one-room schoolhouse in the early 1900s, where children of various ages sat together and were instructed by one teacher (courtesy Confederation Centre Art Gallery/CAGH-72). School promoters such as Egerton Ryerson, the founder of Canadian curriculum development, saw state-controlled schooling as the primary means of assimilating “alien” elements (courtesy PAO/S-2641). Prairie classroom at Bruderheim, Alberta. Prairie schools were to be the vehicles by which immigrants would be assimilated (courtesy Glenbow Archives). During the 18th and early 19th centuries, the family remained the unrivalled setting for education; few children in what was then British North America received formal instruction either from tutors or in schools. The pattern began to change during this period, however, as the British government looked to education as a way of promoting cultural identification with Protestantism, the English language, and British customs. In the years after the Conquest of 1759-60, the British authorities were exceedingly concerned about the strong French Canadian presence in the colony, and they tried repeatedly to assist in the establishment of schools that were outside the control of religious authorities. These efforts were undermined by the Catholic Church and, more importantly, by the disinterest of local communities, in which education was associated more with households than classrooms. However, the concept of schooling became more widespread among social leaders during the early 19th century. In these years, politicians, churchmen and educators debated questions of educational financing, control and participation, and by the 1840s the structure of the modern SCHOOL SYSTEMS can clearly be discerned in an emerging official consensus. The establishment of school systems across Canada during the 19th century followed a strikingly similar form and chronology due to the complex and often competing ambitions of both official educators and parents. Within this similarity, however, were some notable differences related to important social, cultural and political distinctions. The general similarity among school systems in Canada emerged from the ambitions of educational leaders (appropriately described by historians as “school promoters”) throughout the mid-19th century, and the willingness of many parents (though certainly not all) to send their children to school whenever material conditions made it possible. The fact that leading educators were so consistent in their ambitions is not surprising since they not only read each other’s writings, but also were often in touch with each other. The leading figure in Ontario, EGERTON RYERSON, worked in collaboration with Jean-Baptiste Meilleur in Québec, as well as John Jessop in British Columbia. In turn, these school promoters operated in an international context. For example, Egerton Ryerson visited more than 20 countries during 1844 and 1845 when he was developing his proposals for a public school system. Leading educators, or school promoters, argued that mass schooling could instill appropriate modes of thought and behaviour into children. In their minds, the purpose of mass schooling did not primarily involve the acquisition of academic knowledge. School systems were designed to solve a wide variety of problems ranging from crime to poverty, and from idleness to vagrancy. Educators related these potential and actual problems to 3 main causes: the impact of constant and substantial immigration; the transition from agricultural to industrial capitalism; and the process of state formation in which citizens came to exercise political power. While all 3 of these causes played key roles in the minds of school promoters across Canada, the relative importance that each educator attributed to them depended on the regional and cultural context in which the school promoter functioned. In mid-19th century Ontario, the predominantly rural population (with only smaller commercial cities) meant that fears about the impact of massive economic change were based on developments elsewhere rather than immediate experience. However, massive immigration and the importance of state formation were very visible at the local level. During the REBELLIONS OF 1837, rural and village leaders in a variety of communities in central British North America took up arms in pursuit of political change. To many community leaders, the various uprisings supported the argument that school systems were needed to form the rising generation of citizens. School promoters in Ontario often opposed the employment of teachers or textbooks from the United States. Instead, they imported certain components of Irish schools; most notably, the Irish readers which had been written to accommodate a Protestant and Catholic population. This strategy also made sense in that Irish immigrants formed the majority in mid-19th century Ontario. In Québec, the Rebellions were even more important than they were in Ontario, and political concerns loomed especially large in the minds of educational leaders. Given the leadership role of the Catholic Church, however, the construction of an educational state lagged behind while secular and religious leaders debated the division of power and responsibility. Québec set up its first Ministry of Public Instruction in 1868, but abolished it in 1875 under pressure from the Catholic Church, which deemed it was alone capable of dispensing education. Thereafter, Québec was the only province without a Minister of Education. Certainly, immigrants were very visible all along the St Lawrence River extending from the port of Québec City, but many were passing through the province on their way to more western parts of the continent. Similarly, Québec’s economy was undergoing significant change, but only in Montréal could educators argue realistically that schools were needed to offset the negative consequences of processes such as industrialization. On the West Coast, for example, immigration was the primary factor in shaping the mass schooling movement, but it did so in ways quite different from those on the East Coast of the continent. In the case of British Columbia, the key distinction was the arrival of substantial numbers of Asians, beginning with Chinese men who worked in the mines of the Cariboo and then as labourers for railway building. In the early 20th century, Japanese immigrants became a significant group in the fishing industry and to a lesser extent in other forms of commerce and farming. In the context of a predominantly British-origin population, significant Asian immigration fuelled fears about the future of British Columbia as a “white province” and about immediate economic competition. Anti-Asian riots and pressure by groups such as the Asiatic Exclusion League resulted by 1923 in legislation to curtail Asian immigration (including a closed door to the Chinese). During the Second World War continued racism led to the uprooting from coastal villages of those considered to be “Japanese,” including Canadian-born residents of Japanese ancestry, and their forced relocation to internment camps. A great deal of educational conflict and controversy has involved religion and language. The establishment of schools brought local practice under official scrutiny and forced communities to conform to prescribed standards of formal instruction which did not accord with the reality of a diverse society. For example, religious groups did not always agree on the desirability of nondenominational Christian curricula, and their protests led to the growth of parallel Catholic and Protestant school systems in Québec, the provision for SEPARATE SCHOOLS in provinces such as Ontario, and a completely denominationally based school system in Newfoundland. These developments were legally guaranteed by the Constitution Act, 1867, which not only assigned education to the provinces but also enshrined the continued legitimacy of denominational schools that were in place in the provinces at the time that they joined Confederation. In the context of higher levels of Asian immigration and rising prejudice, schooling developed somewhat differently on the West Coast than in the rest of Canada. One noteworthy difference was the emergence of a trend for examinations, especially the first standardized “intelligence tests” during the early 20th century. Somewhat more than provinces such as Ontario, and considerably more than Québec, educators in British Columbia seized upon “scientific” testing as an appropriate way to classify students. The British Columbian leaders focused considerable attention on Asian students and were careful to examine test results in light of each student’s ancestry. The consistent finding that Asian-origin students scored very well astounded educational officials and inspired them not only to concoct explanations based on the selective nature of immigration, but also to continue testing in the pursuit of educational “progress” for the British-origin population of the province. Changing parental strategies help explain why children were sent to school in increasing numbers and for longer periods during the course of the 19th century. The development of agrarian, merchant and industrial capitalism heightened perceptions of economic insecurity. Everyone became aware that while great fortunes could be made, they could also be lost just as quickly. The obvious insecurity of even well-paying jobs or successful businesses came to loom increasingly large in the minds of parents planning for their children. One response was to have fewer children and to invest more in their education. By the mid-19th century, many parents across English Canada were practising contraception in an attempt to raise a smaller number of children with a better quality of life. By the time compulsory attendance legislation was passed in the Canadian provinces (except Québec) during the later 19th century, only a minority of parents were not already enrolling their children in class. Some resistance to schooling did develop, particularly from those reluctant to pay extra taxes, from those who did not approve of the local teacher, and from those who wished to maintain the connection between formal religious instruction and mass schooling. In cities, truant officers rounded up children (particularly from working-class and immigrant backgrounds) and sent them to residential “industrial” schools. However, this resistance was generally focused on the form and cost rather than the need for mass schooling; thus, compromises such as the acceptance of parochial schools (those funded by religious bodies) resolved some of the conflicts. For the most part, the attendance requirements of the compulsory laws were met well before the actual legislation was introduced. Why many parents believed that schooling would improve the prospects of their children was primarily connected to the value attributed to academic training. Unlike the emphasis of school promoters on character formation, the shaping of values, the inculcation of political and social attitudes, and proper behaviour, many parents supported schooling because they wanted their children to learn to read, write and do arithmetic. Interestingly, the perceived value of this academic training was not necessarily dependent on finishing any particular level. While some parents sent their children to school to obtain credentials, many simply sent them whenever other priorities permitted. For example, the attendance of male teenagers declined in communities where industrial jobs were plentiful. Similarly, children’s attendance varied seasonally, particularly in rural areas, where family labour demands were the first priority. There was no neat transition from school to work at any point in growing up. Rather, many children worked and attended school with changing frequencies during the year and from year to year; and, in most cases, their final departure from school was not strongly related to the acquisition of a diploma. However, French Canadians (both in Québec and other provinces) developed a generally weaker attachment to the importance of schooling. Although francophones did begin practising contraception by the mid-19th century, they did so with much less intensity than any other group. In the same way, francophone children increasingly attended school, but to a considerably lesser extent than the average elsewhere. Literacy rates among francophones remained far below the Canadian standard through the early 20th century. Overall, most francophones did not seek to raise a smaller number of children in the same way as most other groups after 1850 and before the mid-20th century. The distinct family reproduction strategies of francophones was a result of many factors, but one important element was the continuing importance of child labour to familial economic activities. To a somewhat greater degree than other groups, francophones continued to seek material survival and security by combining the labour of family members. This strategy was not only apparent in expanding rural areas (both in Québec and Ontario), but also in wage labour settings in villages and cities. Only in the period following the Second World War would a new relationship between school and society take hold among francophones. By the beginning of the 1960s, the Department of Public Instruction in Québec managed over 1,500 school boards, each with its own programs, textbooks and criteria for graduation. In many rural areas, children of different grade levels shared a single one-room schoolhouse. The Liberal government of Jean Lesage saw the need for change and appointed a major commission of inquiry of inquiry on education, which was chaired by Msgr.Alphonse-Marie Parent, at the start of what came to be called the QUIET REVOLUTION. In response to the resulting report’s recommendations the Québec government revamped the school system in an attempt to enhance the francophone population’s general educational level and to produce a better-qualified labour force. Catholic Church leadership was rejected in favour of government administration and vastly increased budgets were given to school boards across the province. The major changes to schooling in Québec were at the heart of the Quiet Revolution. Despite the reluctance of Catholic Church authorities, the Québec government portrayed educational progress as a key strategy for becoming “maîtres chez nous” (“masters in our own house”). More academically focused schooling was promoted as a “national” project; this better education would lead to economic and cultural renewal, and Québec francophones would become part of a fully modern society. In keeping with the aspirations of the Quiet Revolution, the value of schooling for the Québécois was described in two ways. First, leaders emphasized that a legacy of high illiteracy and low attendance rates had to be rejected in order to achieve an appropriate societal level of modernity. Education was promoted as an inherently valuable possession required in contemporary civilization. Secondly, the revamped school system was designed to produce a modern Québec society by ensuring economic competitiveness. Better skills in mathematics and science were particularly seen as an important strategy for overcoming British-origin oppression dating from the Conquest of 1763. The long-established emphasis on religion and the humanities in the francophone schools was not immediately abandoned, but their importance steadily eroded after the early 1960s. The most controversial specific strategy was the language legislation of the 1970s, BILL 101, that insisted on French-language schooling for the children of immigrants to the province. This legislation was designed to reverse the traditional pattern in which immigrants integrated more into the anglophone than the francophone population of the province. The promotion of educational restructuring as a national project in Québec attracted widespread support. Indeed, since the 1960s, officials and parents in Québec have supported higher-quality education with considerable enthusiasm despite massive tax increases to finance the changes. Parents also began embracing the ambition to raise a smaller number of children in whom greater educational investment could be made. During the course of the 1950s and early 1960s, the birth rate in Québec dropped sharply, moving the provincial average from its traditional place at the highest level in Canada and the United States to a position at the lowest level. Interestingly, both religious and secular leaders in Québec opposed this trend — it threatened to decrease the relative importance of the francophone population. Despite this opposition, parents continued to limit family size to an unprecedented extent as part of their changing strategies of family reproduction. The development of public school systems in the 19th century was marked by the standardization of textbooks, teacher training, classroom organization, and curriculum. Children were viewed as clay to be molded in desired forms, but over time a view of children as inherently distinct with varying levels of potential (that is, as seedlings that had to be cultivated according to their individual natures) came to prevail. The changing view of children contributed to the growth of new educational programs (especially at the secondary level) designed to accommodate the differing abilities and potential of different students. Most importantly, technical and vocational courses were developed for students who were deemed unsuitable for further academic study. Not surprisingly, the criteria used for assigning children to various courses reflected cultural and social prejudices more than intellectual assessments. Measures such as IQ tests, developed by the 1920s, revealed unintentionally more about the school administrators than the students, but they were nevertheless used to place different students in different courses of study after the elementary years. This approach has been constantly revised during the 20th century, especially after the Second World War, when the expansion of post-secondary institutions provided a new way of sorting different students into different programs. In these years, educational debate focused on the content of the appropriate CURRICULUM for various age groups. Canada’s educational history has been marked by constant conflict over minority-language education. Most controversies have involved francophones outside Québec, but recently the language question has affected Québec anglophones as well as heritage language instruction to children of immigrant groups (see SECOND-LANGUAGE INSTRUCTION). These conflicts reflect the fact that within the general expansion of standardized public schooling, there have been competing educational visions among policymakers and parents. Similarly, within the concept of a standard education, there has been a sharp distinction between males and females. The ideal public schoolhouse of the mid-19th century included separate entrances, classrooms and recess areas for boys and for girls. In addition, the redefinition of the family as less of an economic unit of production than an association based on emotional attachment was accompanied by the idea that girls should be educated for household responsibility while boys should be trained as breadwinners. By the late 19th century, girls attended HOME ECONOMICS programs to learn cooking and cleaning skills while boys, especially from working-class families, learned manual skills related to factory production. The idealization of women as wives and mothers, as well as the relative lack of other employment opportunities for women, contributed to the feminization of the elementary-school teaching force. While the proper sphere for women was considered the home, young single women came to be viewed as ideal teachers for younger children who could benefit from their supposedly inherent nurturing qualities. Women teachers were poorly paid and were supervised by male officials who saw themselves as the real educators. Even in the later 20th century, many of the earlier patterns remained unchanged. The history of education has therefore been quite different for men and women. Recently, official educators have made efforts to collaborate with aboriginal peoples in developing educational programs that respect cultural identity. The history of Canadian education also includes the establishment in the 19th century of separate schools for blacks in Ontario and Nova Scotia and special regulations for Asians in BC. Such discrimination is no longer official policy in Canada, but more subtle and informal racism is still apparent in some educational programs and textbooks. The history of education in Canada, as in other Western countries, has involved the growth of formal instruction funded by taxes and supervised by the state. This growth resulted from concern about cultural, moral and political behaviour, the emergence of a wage-labour economy, changing concepts of childhood and the family, and the general reorganization of society into institutions. By the late 20th century, schooling had become part of an institutional network which included hospitals, businesses, prisons, and welfare agencies. Various groups experienced this development in different ways, sometimes by official design and sometimes by their own choice. As a result, there are many histories of Canadian education and important distinctions within the general trends. Chad Gaffield. Revised by Dominique Millette. The local douche of the day award goes to….. 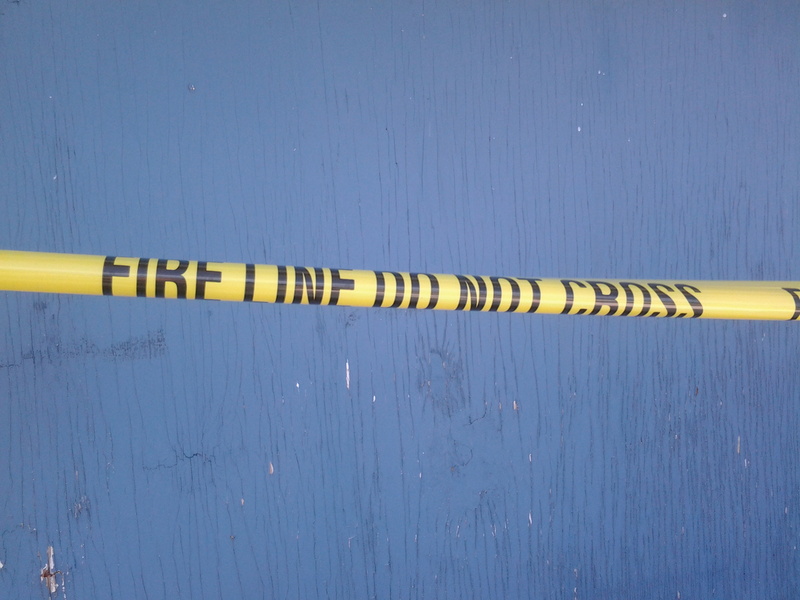 Try not to throw your lit cigarette into an old garage with open gas cans. Who knew? 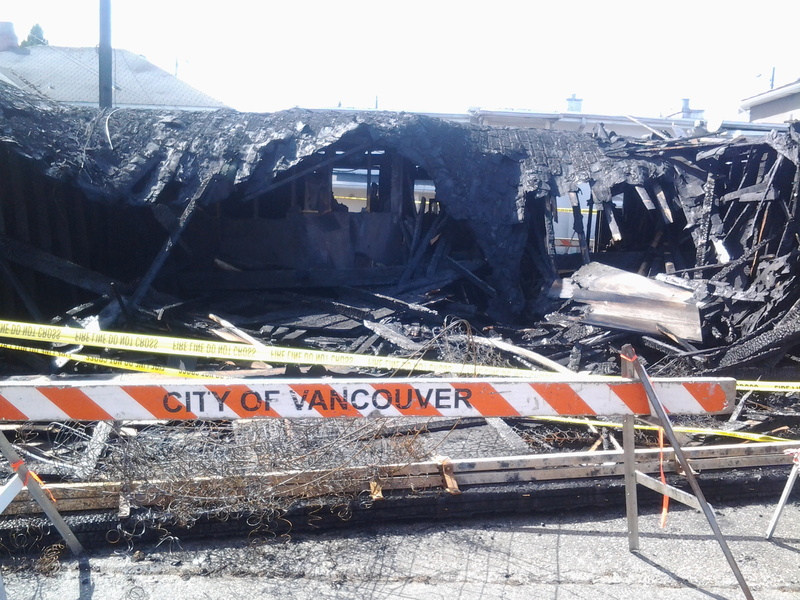 Before you get upset… relax it was a huge drug house that every local resident saw going on for over a year and the Vancouver police had no interest in shutting down. So the dealers and scum shut it down all by themselves. I am very proud of them for taking things into their own hands. No one was hurt, except every single surrounding neighbours property. I hope they do not pay taxes. Happy 125th Birthday Stanley Park! Stanley Park is a 1,001-acre public park that borders the downtown of Vancouver,Canada, and which is almost entirely surrounded by waters of the Pacific Ocean. Its land was originally used by Aboriginal peoples before it became a military reserve in the mid-1800s, when British Columbia was colonized by the British in 1858. Shortly after, when the City of Vancouver was established in 1886, the land was passed to the city and turned into a park. Designated a national historic site in 1988, much of the park remains as densely forested as it was in the late 1800s, with an estimated half million trees, some of which stand as tall as 76 metres (249 ft) and are as many as hundreds of years old. However, many trees were lost in three major windstorms that took place in the past 100 years, the last in 2006. View of Siwash Rock, taken from the rock cliff above. Aboriginal peoples made use of the park area for many generations prior to British Columbia’s colonization by the British. Archaeological evidence in the park suggests a human presence dating back more than 3,000 years. The park area is the traditional territory of different tribes. From the Burrard Inlet and Howe Sound regions, Squamish First Nation had a large village in the park. 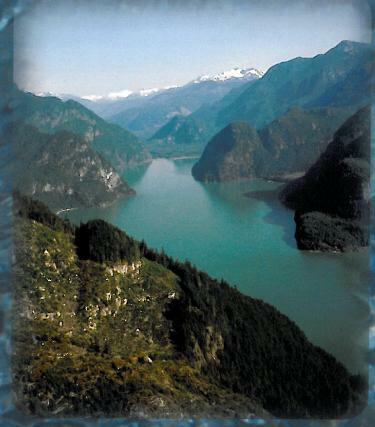 From the lower Fraser River area, Musqueam First Nation used the area for resource gathering. Where Lumberman’s Arch is now, a large village once presided called Whoi Whoi, or Xwayxway, roughly meaning place of masks. The dwellings traditionally used werelonghouses built from cedar poles and slabs. One longhouse was measured at 200 feet (61 m) long by 60 feet (18 m) wide. These houses were occupied by large extended families living in different quadrants of the house. The larger houses were used for ceremonial potlatchs where a host would invite guests to witness and participate in ceremonies and the giving away of property. Another settlement was further west along the same shore, in a clearing where the land starts to slope up to present day Prospect Point. This place was called Chaythoos, meaning high bank. The site of Chaythoos is noted on a brass plaque placed on the low lands east of Prospect Point commemorating the park’s centennial. The popular landmark Siwash Rock, located near present day Third Beach, was once called Slahkayulsh meaning he is standing up. In the oral history, a fisherman was transformed into this rock by three powerful brothers as punishment for his immorality. In 2010, the Squamish Nation‘s Chief Ian Cambell proposed renaming Stanley Park as Xwayxway Park after the large village formerly located in the area. 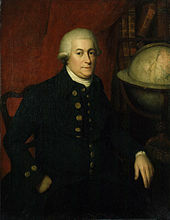 A portrait believed to depictGeorge Vancouver. Chief Joe Capilano of theSquamish people. Here we were met by about fifty Indians in canoes, who conducted themselves with great decorum and civility, presenting us with several fish cooked and undressed of a sort resembling smelt. These good people, finding we were inclined to make some return for their hospitality, showed much understanding in preferring iron to copper. As Vancouver came through the First Narrows, the [natives) in their canoes threw these feathers in great handfuls before him. They would of course rise in the air, drift along, and fall to the surface of the water, where they would rest for quite a time. It must have been a pretty scene, and duly impressed Captain Vancouver, for he speaks most highly of the reception he was accorded. 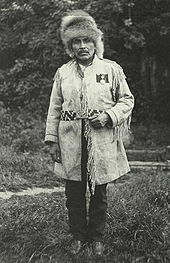 No other contact with Aboriginal peoples in the area was recorded for decades, until around the time of the Crimean War when British admirals arranged with Chief Joe Capilano that in the case of an invasion, the British would defend the south shore of Burrard Inlet and the Squamish would defend the north.According to Capilano’s daughter, the British gave him and his men 60 muskets. Although the attack anticipated by the British never came, the guns were used by the Squamish to repel an attack by an indigenous raid from the north. 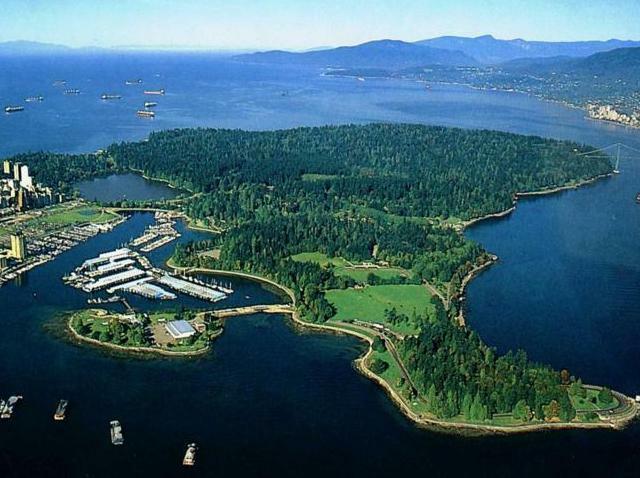 Stanley Park was not attacked but this was the beginning of it being considered a strategic military location by the British. A seagoing dugout canoe carved from a single cedar tree, made by coastal Aboriginal peoples using stone tools. Where Second Beach is now was a place called Staitwouk where they would gather “a clay material or muddy substance formally obtained right in the bed of a small creek… which, when rolled into loaves, as (my people) did it, and heated or roasted before a fire, turned into a white like chalk” This material was used in the making of mountain goat wool and dog wool blankets. The original Aboriginal name references this material. 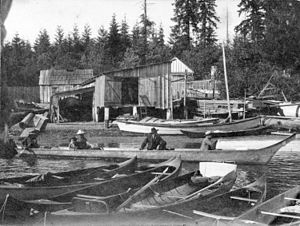 Settlement in Coal Harbour (1897). The center house is a traditional longhouse style of the Squamish people. Coal Harbour was known as a fishing spot for herring. August Jack, a local historian and celebrated dual chief of the Squamish and Musqueam, who once lived at Chaythoos, remembered his early days when he and his brother were “fish-raking in Coal Harbor” and “got lots of herring in (the) canoe”. Almost two decades before Vancouver became a city, a number of Portuguese, Scots, Aboriginal peoples, and others made their home on the Coal Harbour side of Brockton Point, starting in as early as 1860. “Portuguese Joe” Silvey was the first European to settle in the future park. 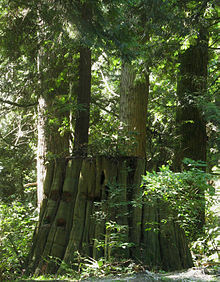 Springboard notched stumps in the park attest to pre-park activities in the late 1800s. Despite the growing number of homes, the Stanley Park peninsula was designated as a military reserve in the early 1860s in a survey conducted by the Royal Engineers. 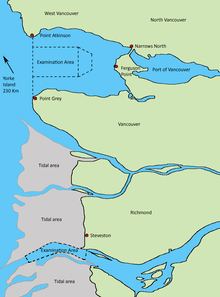 It was again considered a strategic point in case Americans might attempt an invasion and launch an attack on New Westminster (then the colonial capital) via Burrard Inlet. The area was selectively logged by six different companies between the 1860s and 1880s, but the military designation saved the land from extensive development. Most of today’s trails in Stanley Park got their start from the old skid roads. Deadman Island (properly called Deadman Island on official charts and maps) located in Coal Harbour was once used as a burial site. In 1865, newcomer John Morton changed his mind about purchasing the island after finding coffins in the trees. This practice was formerly commonly used to protect remains of important indigenous persons from disturbances by wild animals. During the 1860s to early 1880s, early European settlers along Burrard Inlet also used the island, along with Brockton Point, as a burial ground and cemetery. Burials ceased when the Mountain View Cemetery opened in 1887, just after Vancouver had become a city. During a smallpox outbreak in the late 1880s, Deadman Island became a “pest house” for quarantined victims of the disease and burial site for those who did not survive. 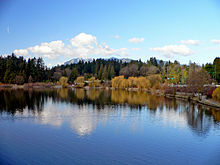 Near the end of the 1800s, the city’s principal reservoir was established in the area south of Prospect Point that is now a playing field and picnic area. Despite the reservoir’s demolition in the 1950s, there is still a “Reservoir Trail” at that location. In 1886, as its first order of business, Vancouver’s City Council voted to petition the Dominion to lease the reserve for use as a park. To manage their new acquisition, city council appointed a six man park committee, which was replaced with the Vancouver Park Board in 1890 that was to be elected rather than appointed (a rarity in North American cities). The Vancouver Park Board manages 192 parks on over 3,160 acres of land, but Stanley Park remains by far the largest. 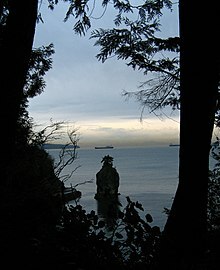 In 1908, twenty years after the first petition for the lease, the federal government renewed the lease of Stanley Park to Vancouver for ninety-nine years, renewable in 2007 (and rolled over in 2008). 1887 map showing the area of the proposed park. On September 27, 1888, the park was officially opened, with the exception of the adjacent Deadman Island, which was retained for military purposes. The park was named after Lord Stanley, who was Governor General of Canada at the time (and who is perhaps best known today for having donated the Stanley Cup that was later handed down to the National Hockey League). Mayor David Oppenheimer gave a formal speech opening the park to the public and delivering authority for its management to the park committee. A statue of Lord Stanley at the quoted moment. 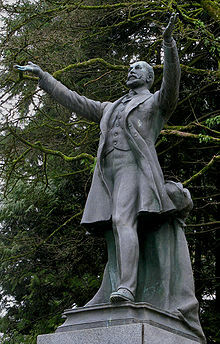 Lord Stanley threw his arms to the heavens, as though embracing within them the whole of one thousand acres of primeval forest, and dedicated it ‘to the use and enjoyment of peoples of all colours, creeds, and customs, for all time. I name thee, Stanley Park. When Lord Stanley made his declaration, there were still a number of homes on lands he had claimed for the park. Some, who had built their homes less than twenty years earlier, would continue to live on the land for years. Most were evicted by the park board in 1931, but the last resident, Tim Cummings, lived at Brockton Point until his death in 1958. Most of the dwellings at Xwayxway were reported as vacant by 1899, and in 1900, two of such houses were purchased by the Park Board for $25 each and burned. One Squamish family, “Howe Sound Jack” and Sexwalia “Aunt Sally” Kulkalem, continued to live at Xwayxway until Sally’s died in 1923. Sally’s ownership of the property surrounding her home was accepted by authorities in the 1920s, and following her death, the property was purchased from her heir, Mariah Kulkalem, for $15,500 and resold to the federal government. The oldest man-made landmark in the park is an 1816 naval cannon installed near Brockton Point. The Nine O’Clock Gun, as it is known today, was fired for the first time in 1898, a tradition that has continued for more than 100 years. The 21:00 firing was established as atime signal for the general population and to allow the chronometers of ships in port to be accurately set. The cannon was originally detonated with a stick of dynamite, but is now activated automatically with an electronic trigger. After a 1969 prank by University of British Columbia Engineering students, the cannon was surrounded by a stone and metal enclosure. 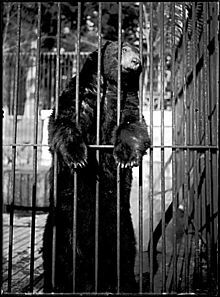 A caged black bear in Stanley Park Zoo, which closed permanently in the 1990s. From the very beginning, the park kept and exibited animals after the first park superintendent (aka park ranger), Henry Avison, captured an orphaned black bear cub and chained it to a stump for safety in 1888. In 1905 a large number of animals were donated that included a monkey, a large seal, four grass parakeets, a racoon, a canary, and a black bear. Avison was subsequently named city pound keeper, and his collection of animals formed the basis for the original zoo, which eventually housed over 50 animals, including snakes, wolves, emus, buffalo, kangaroos,monkeys, and Humboldt penguins. By the 1970s, the zoo with its new polar bear exhibit had become the park’s main attraction. In 1994, when plans were developed to upgrade Stanley Park’s zoo, Vancouver voters instead decided to phase it out when the question was posed in a referendum. The zoo was shut down in 1996 and the animals were either moved to the petting zoo area, the Greater Vancouver Zoo in Abbotsford, or to other facilities. The Stanley Park Zoo closed completely in December 1997 after the last remaining animal, a polar bear named Tuk, died at age 36. He had remained after the other animals had left because of his old age. The polar bear pit, often criticised by animal rights activists, was to be converted into a demonstration salmon spawning hatchery. Domestic animals and a few reptiles and birds continued to be kept at the Children’s Farmyard, until it was closed as a result of budget cutbacks in January 2011. It is not difficult to imagine what the realization of such an undertaking would mean to the attractions of the park and personally I doubt if there exists anywhere on this continent such possibilities of a combined park and marine walk as we have in Stanley Park. James “Jimmy” Cunningham, a master mason, dedicated 32 years of his life to the construction of the seawall from 1931 until his retirement in 1963. Cunningham continued to return to monitor the wall’s progress until his death at 85. The walkway has been extended several times and is currently 22 kilometres (14 mi) from end to end, making it the world’s longest uninterrupted waterfront walkway. The Stanley Park portion is just under half of the entire length, which starts at Canada Place in the downtown core, runs around Stanley Park, along English Bay, around False Creek, and finally to Kitsilano Beach. From there, a trail continues 600 metres to the west, connecting to an additional 12 kilometres (7.5 mi) of beaches and pathways which terminate at the mouth of the Fraser River. 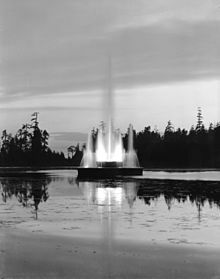 Lost Lagoon fountain in 1936, the year it was installed. It was later restored for theExpo 86 world’s fair. Lost Lagoon lake was created in 1916 out of necessity due to the construction of a causewayinto the park, a project that was not without its detractors. Until then, Lost Lagoon was a shallow part of Coal Harbour and access to the park from Georgia Street was over a wooden bridge. The first phase of the Stanley Park causeway was built between 1913 and 1916. The next phase in the lake’s development came in 1929, when the saltwater pipes entering from Coal Harbour were shut off, turning it into a freshwater lake. Today, the lake features a lit fountain that was erected to commemorate the city’s golden jubilee. The fountain, installed in 1936, was purchased from Chicago, a leftover from that city’s world fair. The causeway was extended through the center of the park in the 1930s, to coincide with the construction of the Lions Gate Bridge, which connects downtown to the North Shore. At the same time, a pedestrian subway with an overhead road was added to the original causeway at the foot of Georgia Street. In 1939, Vancouver’s first public aquarium opened next to the park in English Bay. (The manager was an American named Ivar Haglund, who later moved to Seattle and started Ivar’s Acres of Clams restaurant, which became a successful chain.) The aquarium opened at its present location in June of 1956 after the Vancouver Public Aquarium Association was founded in 1951. The popular children’s song, “Baby Beluga“, was inspired by one of the whales at the facility. In 1964, the Vancouver Aquarium captured the first killer whale ever to be studied alive in captivity. In 2006, the park board approved an $80 million expansion of the facility, following considerable public debate and despite a vocal opposition concerned about animal rights and the loss of park trees required by the expansion. Map showing the location of WWIIdefence forts operated by the 15th Field Regiment, including Ferguson Point (Stanley Park). In World War I, a small temporary gun battery was established above Siwash Rock to protect Vancouver from possible attacks from German merchant raiders. This was removed prior to the end of the war. Then in 1936, when Japan moved into Manchuria, the perceived Japanese threat resulted in fortifications being erected in Stanley Park, amongst other areas, most notably at Tower Beach in Point Grey where submarine watch towers still stand as relics. The military temporarily expanded its use of the park in 1940 by closing the area around Ferguson Point, where it had established barracks for a battery detachment and was providing a training area at Third Beach for the Canadian Women’s Army Corps. What is now the Teahouse restaurant, was originally built as an officers’ mess. With the threat of an attack high on peoples’ minds, a gun battery with two guns were emplaced at Ferguson Point. Remains of the emplacement can still be seen, but its bunkerwas buried. In addition to the coastal defence fort at Ferguson Point, a searchlight tower was built on the cliff above Siwash Rock and remains intact as an observation deck that is accessed from the trails above. Also, an examination area was set up where ships requesting entrance to the harbour had to stop and submit to an inspection by the Royal Canadian Navy. Vancouver Province photo of debris left by 1934-35 storms and warning of the fire hazard if not cleaned up. The park lost some of its oldest trees through major storms twice in the last century and then again in 2006. 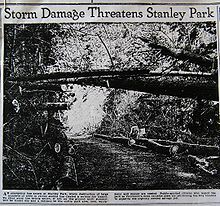 The first was a combination of an October windstorm in 1934 and a subsequent snowstorm the following January that felled thousands of trees, primarily between Beaver Lake and Prospect Point. Another storm in October 1962, the remnants of Typhoon Freda, cleared a 6-acre virgin tract behind the children’s zoo, which opened an area for a new miniature railway that replaced a smaller version built in the 1940s. In total, approximately 3,000 trees were lost in that storm. One stand of tall trees in the center of the park did not survive beyond the 1960s after becoming a popular tourist attraction. The “Seven Sisters” are memorialized by a plaque and young replacement trees in the same location along Lovers Walk, a forest trail that connects Beaver Lake with Second Beach. “They were so popular that people basically killed them by walking on their roots,” says historian John Atkin. The National GeographicWestern Red cedar before it uprooted after being ravaged by the 2006 Hanukkah Eve Windstorm. The death of the distinctive fir tree atop Siwash Rock has also been memorialized with a replacement. The original died in the dry summer of 1965, and through the persistent efforts of park staff, a replacement finally took root in 1968. Another major windstorm ravaged the park on December 15, 2006, with 115 kilometres per hour (71 mph) winds (Hanukkah Eve Windstorm). 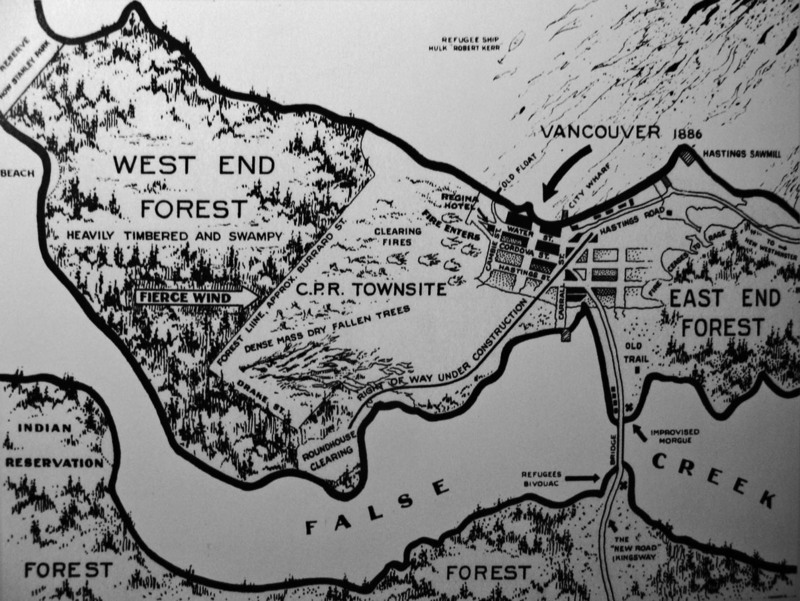 Over 60% of the western edge was damaged; the worst part was the area around Prospect Point. In total, about 40% of the forest was affected, with an estimated 3,000 trees damaged. Large sections of the seawall were also destabilized by the storm, and many areas of the park were closed to the public pending restoration. The cost of restoration has been estimated at $9 million, which will be covered by contributions from all three levels of government and private and corporate donations. Trees growing out of stumps show the regeneration of the park forest. Two landmark trees were affected. One tree that has achieved a lot of fame is the National Geographic Tree, so named because it appeared in the magazine’s October 1978 issue. With a circumference of 13.5 m (44½ ft), it was once one of the more impressive big Western Red cedars of the park. It diminished over time, ravaged by storms, a lightning strike, and topped by park staff to a height of 39.6 metres (130 ft) before being uprooted in October 2007. The Hollow Tree was probably the most photographed park element in bygone years, an obligatory stop for locals, tourists and dignitaries alike, and a professional photographer was on hand to capture the visit for a fee. The tree was saved from road widening in 1910 through the lobbying efforts of the photographer who made his living at the tree. Automobiles and horse-drawn carriages would frequently be backed into the hollow, demonstrating the immensity of the tree for posterity. While the remaining 700–800 year-old stump still draws viewers and is commemorated with a plaque, it is no longer alive and has shrunk considerably over the years, from a circumference of 18.3 metres (60 ft) many decades ago, to a more recent 17.1 metres (56 ft). Damaged by the December 2006 windstorm and leaning forward at a dangerous angle, on March 31, 2008, the tree was targeted by the Vancouver Park Board for removal due to potential safety hazards. However, on January 19, 2009, the Board accepted a proposal to save the tree by realigning and stabilizing it at a cost of $250,000, funded entirely by private donations. The forest continues to give the park a more natural character than most other urban parks, leading many to call it an urban oasis. It consists of primarily second and third growth and contains many huge Douglas fir, Western Red cedar, Western Hemlock, and Sitka Spruce trees. Since 1992, the tallest trees have been topped and otherwise pruned by park staff for safety reasons. While it is not the largest of its kind, Stanley Park today is more than 10 percent larger than New York City’s Central Park and almost half the size of London’s Richmond Park. It contains numerous natural and man-made attractions that draw about eight million people to the park every year, including locals and tourists. Recreational facilities are especially abundant in the park, having long co-existed, albeit uneasily, with the aesthetic and more natural park features preferred by those looking to the park as an enclave of nature in the city. Vancouver Seawall. The 2006 windstorm subjected portions of the seawall to mudslides and falling debris, forcing park staff to temporarily close it for repairs. 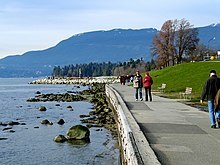 The Vancouver Seawall is a popular destination for walking, running, cycling, inline skating, and even fishing (with a licence). There are two paths, one for inline skaters and cyclists and the other for pedestrians. The section around the outside of the park is one-way for cyclists and inline skaters, running counter-clockwise. There are also more than 27 kilometres (17 mi) of forest trails inside the park. Forest trails are patrolled by members of the Vancouver Police Department on horseback. The stables(open to the public) are located in the service yards of Stanley Park near the Rose Gardens at 605 Pipeline Road. A miniature railroad was built in an area leveled by Typhoon Freda in the 1960s, and is especially popular as seasonal “Halloween Trains” and “Christmas Trains”. The windstorm of 2006 revealed traces of a long-forgotten rock garden, which had once been one of the park’s star attractions and one of its largest man-made objects by area. Since its discovery, a large section that encircles the Stanley Park Pavilion has been restored (the 1920s’ version extended from Pipeline Road to Coal Harbour). “Royal” lily pads on Beaver Lake. Beaver Lake is a restful space nestled among the trees. The lake is almost completely covered with water lilies (introduced for the Queen’s Jubilee in 1938) and home to beavers, fish, and water birds. As of 1997, its surface area was just short of 10 acres, but the lake is slowly shrinking in size. One of Vancouver’s few remaining free-flowing streams, Beaver Creek, joins Beaver Lake to the Pacific Ocean and is one of two streams in Vancouver where salmonstill return to spawn each year. The Vancouver Aquarium is the largest in Canada and houses a collection of marine life that includes dolphins, belugas, sea lions, Harbour seals, and sea otters. In total, there are approximately 300 species of fish, 30,000 invertebrates, 56 species of amphibians and reptiles, and around 60 mammals and birds. Lost Lagoon, the captive 41-acre freshwater lake near the Georgia Street entrance to the park, is a nesting ground to many bird species, including swans, Canada geese, and ducks. Numerous varieties of other animals live in the park, including 200 bird species, such aspeacocks descended from the old zoo, as well as other non-native species. A large great blue heron colony took up digs in a grove of trees near the Park Board Administration Office in 2002. The heronry has continued to grow, with more than 170 active nests recorded last year which are expected to fledge over 200 chicks in a normal season. Mammals include a largeraccoon population, coyotes, skunks, beavers, rabbits descended from discarded pets, and a thriving grey squirrel population (descended from eight pairs acquired from New York’s Central Park in 1909). The park also contains rose and rhododendron gardens, tennis courts, an 18-hole pitch and putt golf course, a seaside swimming pool at Second Beach, and the Brockton Oval for track sports, rugby, and cricket. For entertainment, there are events throughout the year, especially in summer, and the open-air summer theatre Malkin Bowl (rebuilt after a fire in the 1980s), which is home to the localTheatre Under the Stars. Girl in a Wetsuit, which is a take on theThe Little Mermaid bronze in Copenhagen. 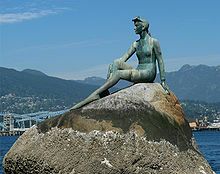 Stanley Park has accumulated a large collection of monuments, including statues, plaques, and gardens. Among these are a memorial to writer Pauline Johnson where her ashes are buried; statues of Lord Stanley, poet Robert Burns, Olympic runner Harry Jerome, and 29th U.S. president, Warren Harding; plaques commemorating the wreck of the SS Beaver, the sinking of the Chehalis (a tugboat that collided with the MV Princess Victoria off Stanley Park), and the Salvation Army; a replica of the RMS Empress of Japan figurehead; a bronze statue of a Girl in a Wetsuit by Elek Imredy; and a timber-and-stump archway that replaced the original Lumbermen’s Arch built by lumber workers for a visit by the Duke of Connaught, which ultimately succumbed to rot. Reflecting the view that the park should be kept in a more natural state and is already saturated, the park board has banned the erection of any further memorials. In what some have considered an exception to the ban, the park board agreed in 2006 to build a new playground at Ceperley Meadows near Second Beach honouring the victims of the Air India Flight 182bombing. The federal government spent approximately $800,000 to build the playground, which was completed in the summer of 2007.A local historian has also suggested the appropriateness of memorials marking the sites of communities that were displaced in the making of the park at Lumbermen’s Arch (Whoi Whoi, or Xwayxway), Prospect Point (Chaythoos), Brockton Point, and Kanaka Rancherie (at the foot of Denman Street), although a formal proposal has not been put forth. Just west of the Nine O’Clock Gun there is a plaque commemorating these communities. Vancouver history in a nutshell. Here, in a nutshell, are some of the highlights of Vancouver’s sometimes oddball history. 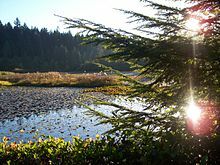 16,000 to 11,000 BC: Segments of the Coast Salish people-the ancestors of the Squamish, Burrard, Tsleil-Waututh, Musqueam (Xw’muthk’i’um), Tsawwassen, Coquitlam (Kwayhquitlam), Katzie and Semiahmoo Indian bands-arrive from Asia. They seem to be quite satisfied with the beaches teeming with seafood-they named English Bay Ayyulshun, which means ‘soft under feet’. 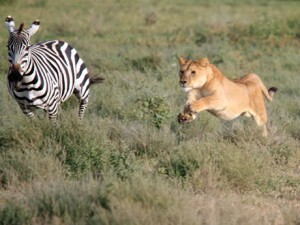 And they liked the forests teaming with wildlife. Not to mention that nearby is the mouth of a big river emptying into a vast ocean where big, fat, silvery salmon swam by six months out of every year. 1808: Simon Fraser, an explorer and fur trader arrived here following an overland route from Eastern Canada by a river he thought was the Columbia. Even though he was wrong about his travel plan the river was still named for him. 1827: Hudson’s Bay Company built a trading post on Fraser River. It was the first permanent non-native settlement in the Vancouver area. Since 1893 the company has occupied a prime location at the corner of Georgia and Granville in Vancouver’s downtown core and they’re still trading. 1858: The news there was gold on the banks of the Fraser raised a bit of interest. About 25,000 prospectors dropped in to have a look. 1860: Three English who should have stayed out of the sun built a brickyard. The business flopped amid much guffawing and “I told you so’s” from the local population. They were called the “Three Greenhorns”; the area is now known as the West End, one of the most populated places in North America. And there’s no shortage of brickwork in the surrounding buildings. 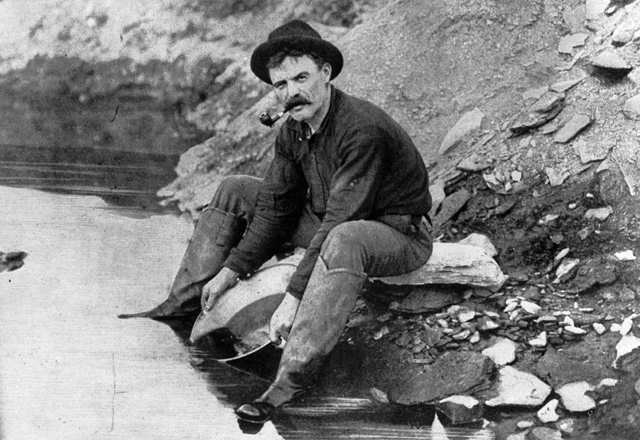 1867: A talkative chap nicknamed “Gassy Jack” opened a saloon for forestry workers on the shore of Burrard Inlet. It became so popular a community built up around the place and called itself Gastown. 1870: Gastown is incorporated as the town of Granville. 1884: The Canadian Pacific Railway moved its terminal from the head of Burrard Inlet to the area of Granville, now known as Coal Harbour. Port Moody was miffed but Granville grew like Topsy. That same year the vessel Robert Kerr left England with Seraphim Fortes aboard. Seraphim, from Barbados who had been living in Liverpool working as a bath attendant and swimming instructor, was heading for Victoria when the ship foundered. It was towed into English Bay and ‘Joe’ Fortes thought well, what the heck, I might as well stay and do the same kind of work here. 1886: Granville incorporated as the City of Vancouver: now that it had about 1,000 people. The first mayor was realtor M.A. McLean. On June 13 a brush fire got away and burnt the city to the ground in less than 30 minutes. McLean knowing the value of real estate got rebuilding going in a matter of days. 1887: The CPR’s first train arrived; the final stop of the first transcontinental trip. 1888: The last body is buried in Pioneer Cemetery, the graveyard of many of Vancouver’s earliest citizens. The cemetery stretched from Brockton Point to the Nine o’clock Gun. Why no more? Well: 1888 was when the road that would eventually wind around Stanley Park was first constructed in the Brockton Point area. The first perimeter road around Stanley Park was paved with the shells from native middens (refuse heaps) in the park. 1889: The first Granville Street bridge is completed. There was another one built in 1909. The one that’s there now is the third built in 1954. 1889: The original Capilano Suspension Bridge was built. 1890: The first lighthouse is built at Brockton Point. Electric streetcars began operating this year. 1891: The city’s first tram-based public transit system, the Interurban starts up. 1898: Sand is added to English Bay Beach. Up to that time you had to walk through bushes to get to it. A large rock on the beach separated men and women bathers (no peeking!) The Nine o’clock Gun is placed at Brockton point. People still set their watches by it. 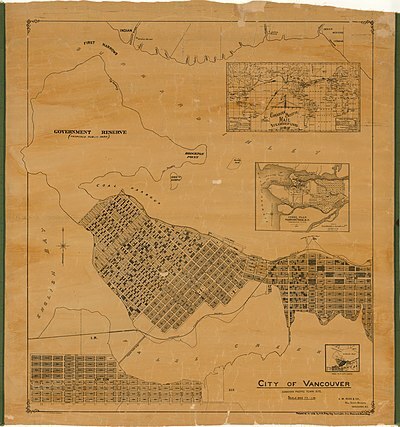 1900: Vancouver surpasses the provincial capital of Victoria in size. Did they immediately move the capital to Vancouver? No. 1902: The first meeting of the Vancouver Information & Tourist Association was held on June 25, 1902. Today, the organization celebrates more than 100 years of operation and is now known as Tourism Vancouver. 1905: Johann and Anna Breitenbach arrive in Vancouver from Brisbane, Australia aboard the Aorangi. They were two of hundreds of new immigrants to Vancouver as the flood of people moved through to settle the Prairies. The Breitenbachs stayed and their descendants are still in Vancouver. The trip took a month; they travelled in steerage the whole way. They brought their ten kids with them. And you think commuting today is tough. 1909: The Dominion Trust Building, the city’s first skyscraper opens at Hastings and Cambie. It’s still there but looking kind of puny. The same year the second Granville Street Bridge opens. 1911: Canada’s first artificial ice rink, the Arena, opened. People immediately begin skating around the edge counter-clockwise. It was at 1805 West Georgia at the corner of Denman. At the time it was the largest indoor ice rink in the world. The Vancouver Millionaires, the city’s first hockey team, was built out of players swiped from the National Hockey League. The 1914-15 season: The Millionaires become Stanley Cup champions. 1915: The first lighthouse at Brockton Point is torn down and the current one is built. You notice the arch at the bottom of the current lighthouse? That was going to be part of a boathouse until somebody noticed that the ocean current right there would make it easier to not store boats there. The University of British Columbia (UBC) opens for business. A few bleary-eyed students show up. There are now more than 46,000 students at the verdant waterfront campus. UBC opens at a temporary headquarters at the former McGill University College facilities adjacent to Vancouver General Hospital (nicknamed the Fairview “shacks” after the surrounding neighbourhood). 1920: Vancouver grows bigger than Winnipeg, which was the main city of western Canada. For its next trick the city’s population turned out in droves to watch Houdini suspend himself from the top of the Sun Tower. He chose that building because that’s where The Vancouver Sun’s offices were located at the time. 1922: ‘Joe’ Fortes dies of pneumonia. The City paid for his funeral and thousands of people, many of whom learned how to swim with Joe’s meaty hands holding them up in the lukewarm waters of English Bay, lined Granville and Hastings Streets to say goodbye. UBC students organize a province-wide publicity campaign to persuade the government to complete the Point Grey campus. The “Build the University” campaign climaxes in a parade (the “Great Trek”) from downtown Vancouver to Point Grey, and the presentation of a petition with 56,000 signatures to the Speaker of the Legislature in Victoria. The government authorizes a $1.5 million loan to resume construction. The campaign marks the beginning of active student involvement in the University’s development. 1925: The first Second Narrows Bridge connects the city with North Vancouver. The one that’s there now is the second one. 1931: The English Bay bathhouse was constructed out of concrete replacing the first bathhouse, which was made of wood. 1936: The new City Hall at 12th Avenue and Cambie is dedicated. It still looks like it ought to be in Gotham City. The same year the Denman arena was destroyed by fire. 1938: The Lions Gate Bridge is completed so a real estate company can at last sell the property it bought on the North Shore. It was engineered to last about 50 years. 1939: The landmark Hotel Vancouver is completed. 1954: The British Empire and Commonwealth Games Association of Canada donated the flag after the name change was voted on in 1952, and it was used for the first time at the 5th British Empire and Commonwealth Games in Vancouver in 1954. The games featured the Miracle Mile, in which two runners-Roger Bannister and John Landy-both broke the 4:00 minute mark for the mile, the first sports event televised to all North America. 1957: Elvis Presley sings a half dozen songs and leaves the stage after 15 minutes. The audience paid $2 per ticket and were pretty cheesed by being short-changed. 1959: A busy year. The city’s first shopping mall, the Oakridge Centre, the Queen Elizabeth Theatre and the Vancouver Maritime Museum all open. That year they also sunk the George Massey Tunnel-most people still call it the Deas Island Tunnel. Fortunately, sinking it was the right thing to do because it goes under the Fraser River. 1964: For the first time the BC Lions won the Canadian Football League’s Grey Cup. 1974: The locomotive Royal Hudson logs its inaugural run since being rebuilt. People are steamed today, not because the famous loco plied the Squamish run for so many years, but because it’s now toast. Efforts however are currently underway to rehabilitate the Royal Hudson and hopefully it will soon be making its picturesque journey. 1979: The Vancouver Whitecaps won the North American Soccer League championship. 1983: BC Place Stadium inflates and becomes the world’s largest air-supported dome. It has 60,000 seats. Let’s put that in perspective. If you put all the residents of Vancouver in it when the city was incorporated 97 years earlier, you would have 59,000 empty seats. 1985: SkyTrain starts up mid-December. The initial route, from Vancouver to New Westminster, retraces in part one of Vancouver’s original Interurban lines. 1986: Vancouver’s centennial is marked by the highly successful six-month fair Expo 86 on the north shore of False Creek. It was the largest special category World Exposition ever staged in North America -the category was Transportation. 1985: Vancouver holds its first Vancouver Sun Run, a 10 kilometre run through downtown streets and spectacular Stanley Park. Now an annual, very popular event, first year’s participants were 3200 – by 2003 there were approximately 49,000 runners – a true reflection of the love of sport in the outdoors! 1988: The first ever Vancouver Gay Pride Festival. Now also an annual, week long event, it includes a parade and a variety of celebrations and parties throughout the city. 1990: The 1990s began with a roar as the first “Indy” race took place on the downtown Vancouver track, winding through tight corners, past apartment complexes, False Creek and Science World. It was an annual event held each summer, however 2004 was the final year that it took place in Vancouver. 1993: Woodward’s department store, a Canadian retail institution dating back to 1903, goes bankrupt and closes its doors. Over the following years, debate regarding reuse of the landmark building or redevelopment of its property has ranged from the creation of affordable housing to a downtown parking complex to various retail options. Today, there are several housing options still being reviewed. 1994: The Vancouver Canucks reach the Stanley Cup finals but lose in the final moments of the final game. The BC Lions football team won the Grey Cup for the second time in their history. 1995: The new Vancouver Public Library building opens and is a landmark within the downtown core. Interestingly, initial designs had the building facing the opposite direction, with the main entrance facing Georgia. As they finalized construction plans, someone noticed that by flipping the design, the main plaza would face the sun rather than being in the shadow of the main building! General Motors Place (currently Rogers Arena) for hockey, basketball and musical performances, opens and is nicknamed ‘The Garage’. The spiffy Ford Centre for the Performing Arts opens for what turned out to be for three years before it reopened as The Centre in Vancouver for Performing Arts, and today offers large-scale theatrical productions several times a year. 1996: Estimates show the central city’s population had increased by more than 107,000 since 1981-a 26 per cent jump! The Vancouver Grizzlies joined the NBA, along with the Toronto Raptors, as part of the league’s two-pronged expansion into Canada. They are the first non-U.S. cities to join the league since 1946-47. Unfortunately, the Grizzlies were sold in 2001, so Vancouver only got to enjoy their NBA team for 5 years. 1997: The Chan Centre for the Performing Arts opens at the University of British Columbia, offering year round performance by University programs, touring companies and local performers. 1999: Vancouver creates the 2010 Olympic Bid team to organize the proposal to host the 2010 Winter Olympics. By July, 2004, Vancouver is selected! 2000: The annual Polar Bear Swim, started in 1920 by a local restaurant owner, Peter Pantages, reaches a record of 2,128 swimmers. 2001: It is estimated that 200 movie and television productions are filmed in Vancouver. Each year, this list grows more and more substantial, as estimates from 1981 show only 11 productions! Earning its nickname of ‘Hollywood North’, celebrity spotting is everywhere – they’re out and about on Vancouver streets, browsing in shops and relaxing in local restaurants and spas. 2002: The Economist magazine’s Intelligence Unit ties Vancouver and Melbourne as the World’s Top City to live in. 2003: Mercer Human Resource Consulting rates Vancouver as top city in North America for quality of life. July 1 – Canada Day – 2003, Vancouver is selected as the Host City for 2010 Olympic and Paralympic Winter Games. Rogers Arena broadcasts the announcement live to a sold out crowd, while celebrations take place across the city. 2004: The hosting of the first large outdoor public arts show on the streets of Vancouver called ‘Orcas in the City’ by the BC Lions Society. 2009: A major expansion to the Vancouver Convention Centre opens, tripling the capacity of the original Canada Place venue. The green, grass-roofed West Building is Canada’s largest waterfront convention centre. 2010: The region enthusiastically hosts the Vancouver 2010 Olympic and Para-lympic Winter Games in February and March. More than 2.5 billion people around the world tune in to watch 2,600 athletes from 82 nations compete. The highlight for Canadians? Winning the men’s hockey gold medal. 2011: Vancouver celebrates its 125th birthday with a year-long party of events and performances taking place throughout the city. I hope you follow my blog, If you don’t I have no idea why. I would like to open this post softly by suggesting If you were a zebra in the open plains of Africa you would be the zebra the lions took down. Dave you are “special”. I hardly ever post in my own words I do a lot of cut and paste. I work every day of the week. Ever looking for the bright side Dave. Meh you at the very least inspire me. If you were a douche, hmmm, the bottle lets say, your as useful as if it was empty. You may not pay for a fifty-cent item with only pennies. Citizens may not publicly remove bandages. It is illegal for clear or non-dark sodas to contain caffeine. Businesses must provide rails for tying up horses. Wooden logs may not be painted. Calgary – If you are released from prison, it is required that you are given a handgun with bullets and a horse, so you can ride out of town. Edmonton – Horses are not allowed to stand on the streets for more than 20 minutes. It is illegal to kill a Sasquatch. Victoria – Street entertainers aren’t allowed to give kids balloon animals. Driving on the roads is not allowed. When raining, a person may not water his/her lawn. Etobicoke – Bylaw states that no more than 3.5 inches of water is allowed in a bathtub. Oshawa – It’s illegal to climb trees. Ottawa – It’s illegal to eat ice-cream on Bank Street on a Sunday. Toronto – You can’t drag a dead horse down Yonge St. on a Sunday. Toronto – You’re not allowed to release 10 or more helium balloons within 24 hours. It’s illegal for margarine to be the same colour as butter. Montreal – The Queen Elizabeth Hotel must feed your horse freely when you rent a room. Montreal – Cars parked in public places must be locked, and their windows must be down to less than the width of a hand. Quebec City – You may not swear in French.